Nope, it isn’t working. 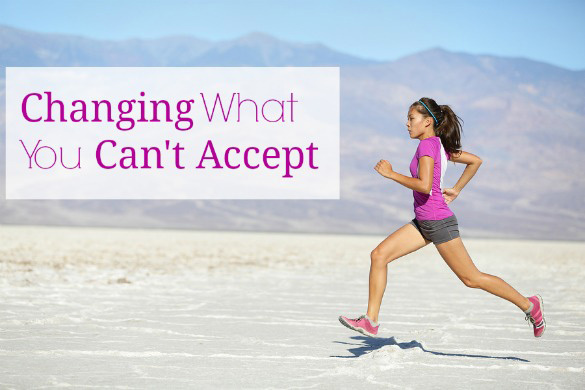 I do not accept the things I cannot change, although I do wish to change the things I cannot accept. Sound familiar? It is no secret that we are our harshest critic, and chances are, we are our own worst enemy as well. I’m writing this as I watch American Ninja Warrior. They are strong, fierce and confident. They are what I aspire to be: accepting. They accept their strengths and weaknesses and try, try, try again! Acceptance is a funny thing. We are asking ourselves to believe in ourselves. Believe in what we are and who we are. If we can believe, which we do, why can’t we accept the struggle? The struggle is not going to go away, it will always be there. We will always fight the desire to back down on our journey, to give up. Whatever that journey may be — health-related, personal, mama or soon-to-be. We fight it. We get mad, angry, pissed, furious and sad. We put so much energy into what is NOT happening rather than what HAS happened. Once we can find happiness in our struggle, then we can accept this struggle for what it is. Once we can accept it, girlfriend, we can move mountains. Once we give up the fight, and recognize this is how things are, we can make plans. We can research and find support, we can ask for help and be more open to advice. We are not going to win it all, we aren’t going to find all the answers, and we aren’t going to like everything we hear, read and see. However, if we are accepting of the struggle, we need to be accepting of the information to help bring us forward. Not everything will be sunshine and rainbows, but it sure as heck will be worth it! This post really hits home for me today! I am confronted with a huge life changing decision for me and my family. Move us across the country to keep my job or take severance. I am so angry and have been fighting it. But I have to just accept it, make a decision and move on with my life. No answers here. Just glad to see this post. Maybe the first step in changing my mindset.